This salvia has only been available in Australia this century. It comes from South Africa and is a great addition to the other South Africans that do so well here especially as it has large white flowers. 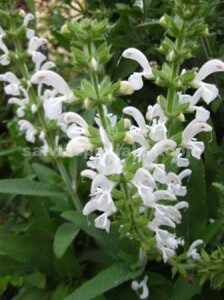 Radula is a small evergreen shrub to around a metre, with frequent white flowers that set seed. Closest other South Africans would be disermas and eigii but their flowers are not so prominent. Radula can be grown by cuttings or seed.